WIRELESS CHARGER AND POWER BANK DESIGN: The Wireless power bank is a combination of a wireless charger pad and a power bank, you can use it to wireless charging your phone or wired charging. 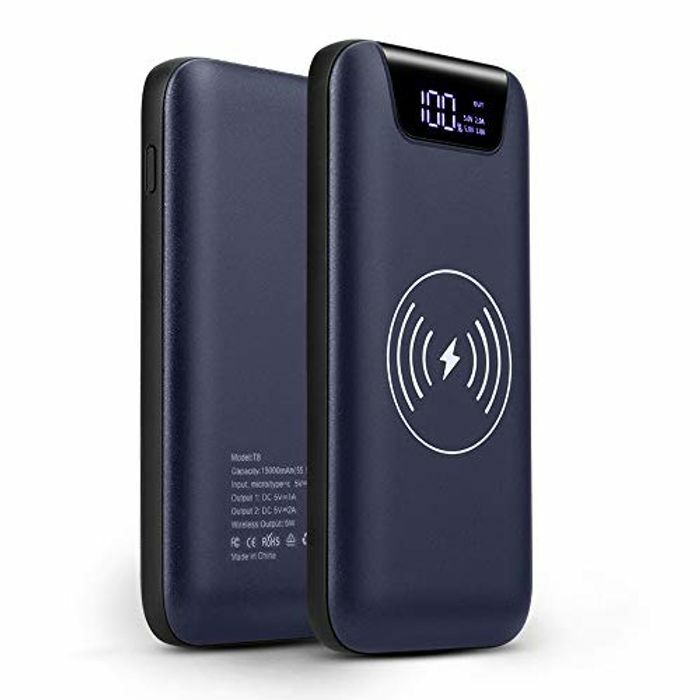 HIGH CAPACITY: This wirelss power charger built-in 10000mAh polymer external battery pack, can fully charge iPhoneX 3 times, Galaxy S6 2 times, iPad mini 1 times, with most phones you will get 2-3 full charges of your phone. CHARGE 3 DEVICES SIMULTANEOUSLY: This Wireless Portable Charger with 2 USB outports which means you can charge 3 devices at the same time. Two Wired charging and one Wireless charging. SMART LED DIGITAL DISPLAY: Our power bank with a smart screen, press the button on the right side once to open the LED display. Easy to look at the remaining power with the intuitive number. SAFETY AND PROTECTION: Built-in protection against short circuits, designed to protect your device against surcharges and overheating, ensuring safe charging without having to worry about the high temperature produced in charging.